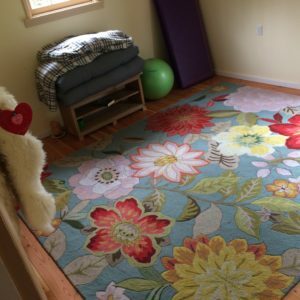 This post was updated October 2018 to share my ongoing sleep-environment journey and to add a few more transitioning steps. I sleep on the floor. I didn't always do this, I started in a bed like most of you reading this did too. But, over the last five years I've been trying to move more of my body as well as need less corrective exercises for movement I haven't been doing. Thus, I'm putting more getting up and down into my life. I'm putting more pressure-deforming movements into my life. I'm doing more to be less uncomfortable (i.e. more comfortable) without heaps and heaps of cushions everywhere because if I'm only comfortable in my house, sleeping in my bed, then it means I'm not very resilient or able to spend long stretches out in nature which is our overarching goal as a family. Changing your sleeping surface doesn't seem like it needs a training program, but I'd say otherwise. You're pretty great at anything you've been doing for 40 years so why not approach this just as you'd approach any other physical feat. P.S. This one you physical challenge you can actually take lying down. Step 2: Start sitting on the ground more when you're not sleeping. Again, while "sitting" might be the whole-body state, you're actually mushing your parts into the ground the same as you'd be doing if you were rolling out on foam or balls. Step 3: Speaking of rolling out, being able to adapt to unique pressure is huge when it comes to physical resiliency. There are balls and rollers and books and videos and programs that are all about exposing your body parts big and small, to pressure (and the movements that pressure and shape create). If you're uncomfortable with pressure, then start a program to make your body better able to tolerate the change in shape that interacting with a firm, various-shaped environment requires. Step 4: All corrective exercises in my books and videos are to make your parts more mobile head-to-toe. Immobility will be challenged by gradually changing what you're sleeping on, but the more you work on your mobility in the form of specific exercises, moving more, and changing your sleep environment, the more each facilitates the others. Step 2: If you have foam over the top of your mattress or a bulky mattress pad, get rid of it and sleep on your de-cushioned bed. Step 4: Put your mattress on the ground and list your box springs and bed frame on Craigslist for $200.00. Step 5: Answer three emails from those responding to your Craigslist ad. Surprisingly, they're all college students moving in to your area from Kansas who want to put money directly into your bank account because they're currently awaiting their financial aid package of $35,000, but only have their parents' money to pay you with today, if you can just send your bank account information. Step 6: DO NOT send them your account information. Step 7: Meet with the one person who answered your ad on Craigslist to let them see the frame and box springs, only to have them offer you $25.00 because they wanted something larger (than the Queen size you listed in your ad). Step 8: Sleep on your mattress (both sides of it) on the ground for awhile. Step 9: Create a bedroll with sleeping bags, blankets, sheets, on the ground, and sleep on that for a while. Step 10: List your mattress, box springs, and bedframe on Craigslist for $400.00 (as you paid $1000 three years ago...). Step 11: Repeat Steps 4 through 7. Step 12: Keep it all in your garage for 3 years and then list in on Free! section of Craigslist and have someone text you 3 minutes after you've listed it. Load it into their truck 25 minutes after you listed it. Step 13: Stop using Craigslist with the exception of reading "Missed Connections" for entertainment. And, because, you never know. In case you were thinking of trying this for a week like one reported did, bear this in mind: it took me eighteen months to go from my mattress of five years to a 3" foam mattress pad I got from Costco. 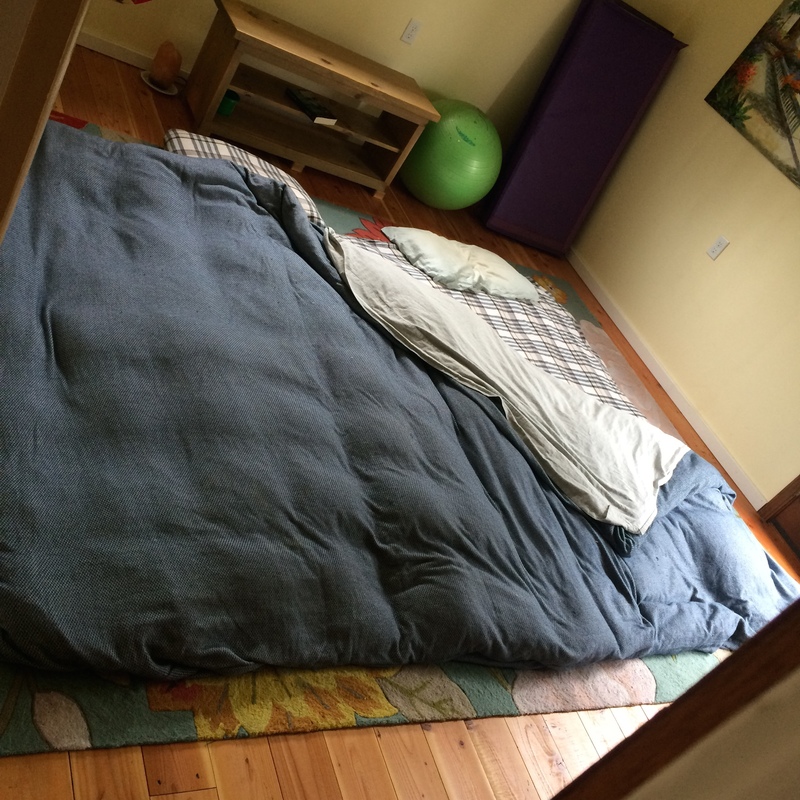 Once that turned out to be too moldy of an option in our home in the Pacific Northwest, we built some platforms to raise the bed for airflow's sake. We also upgraded to less toxic material. Alas, we still had mold and realized that to be free of the materials we wanted to be free of, as well as rich in movement, we'd have to roll out and pick up our bed every day. So, that's what we do now, over six years into this movement-journey. 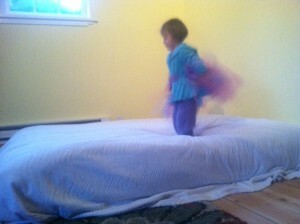 Q: Why the heck would I want to not sleep on a mattress? A: It's about natural loads and reducing repetitive/unnatural loading to (i.e. deforming of) your cellular bodies. Read Move Your DNA for a more detailed explanation or at least start by reading "Instinctive sleeping and resting postures: an anthropological and zoological approach to treatment of low back and joint pain" from the British Medical Journal. Q: What about pillows? Should I get rid of my pillow? Do you use a pillow? A: I use my pillows as headboards (see pic) to reduce the coldness of our heads, and they're also fun for reading in bed and pillow fights. I don't use one under my head, but my husband still does. To read a similar "how to transition out of a pillow" (which implies that you're currently inside of one, but you get what I mean), read Your Pillow is an Orthotic. Q: I don't see myself sleeping on the floor any time soon. Any hope for me? A: Of course. Start with the first steps in body and gear prep. Boom, you're experiencing new loads. Sleep on your guest bed sometimes. This is not about perfection, it's about moving more in the ways that you can.